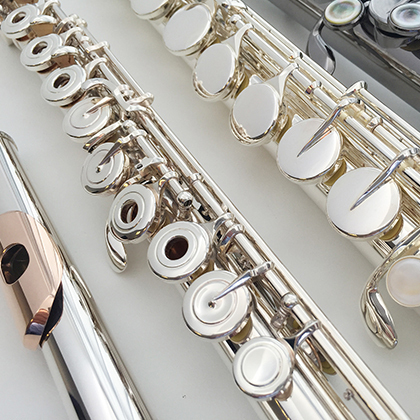 From the Trevor James 10x beginner flute to the handmade professional model there is a Trevor James flute waiting for you. Check out the brand new (currently only available in certain International markets) TJ Cantabile and TJ Virtuoso models with the fabulous new 'Voce' headjoint! TJ Recital 2 - Handmade flute with FMG headjoint / 925 silver body, soldered tone holes. TJ Recital 3 - Handmade flute with FMG headjoint / 925 silver body and mechanism, soldered tone holes. 14k gold plating available on all 'Performers' and 'Recital' models. Free blowing alto flutes in different finishes - each with their own unique and beautiful voice - drawn tone holes.